Detroit Bankruptcy Plan Proposes 34 Percent Cut To Pensions : The Two-Way All told, the plan proposed by the city's Emergency Manager Kevyn Orr will cut the city's debt and liabilities by $18 billion. 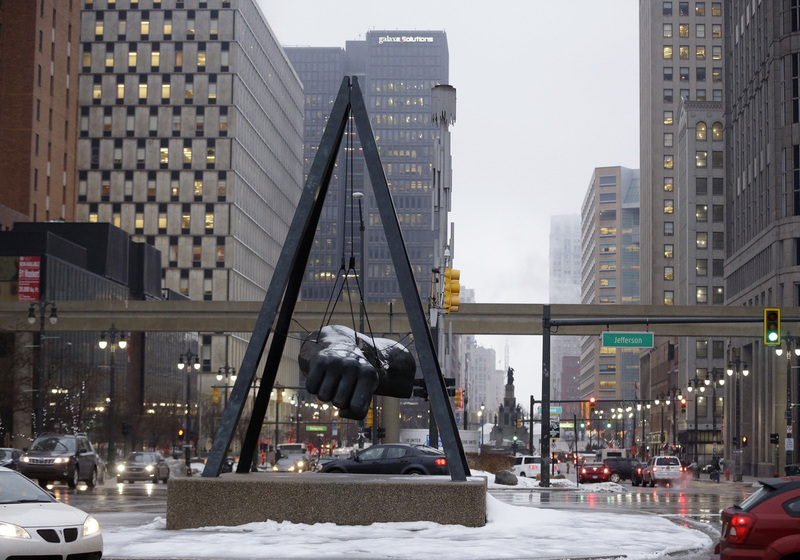 The monument to the boxer Joe Louis in Detroit. The city of Detroit filed a so-called exit plan with a federal bankruptcy court on Friday. The plan, intended to resolve the largest municipal bankruptcy in U.S. history, would free up cash and allow the city to resume providing some basic services to citizens of Detroit. The Detroit Free Press reports that the plan proposes paying retired city workers and retired policemen and firemen less money for their pension. "The city proposed 34% cuts to pensions of general city retirees and 10% pension cuts to police and fire retirees. But those cuts would be reduced to 26% and 4%, respectively, if the city's two independently controlled pension boards agree to support the plan of adjustment. "The city proposed paying secured bondholders 100% of what they're owed, while general obligation bondholders would receive 20%." The AP adds that all told, the plan proposed by the city's Emergency Manager Kevyn Orr will cut the city's debt and liabilities by $18 billion. "Among the improvements the city plans is spending $520 million over six years to remove blight, according to the plan of adjustment. With that cash, the city would demolish about 450 abandoned homes a week, up from a weekly pace of 114 in a city with an estimated 78,000 unsalvageable structures. "The city proposes fresh investments in public services — including police, blight removal, antiquated computer and technology systems upgrades and plans to attract new residents and businesses. "That would include $148 million on technology improvements to rehab Detroit's antiquated IT system and $447 million on major capital improvements including its vehicle fleet and facilities for police and fire services and the city's recreation department. During the next five years, the plan would invest $114 million more in the police department and an additional $82 million for the fire department." The plan is still subject to change, depending on negotiations with creditors and pension boards. It also has to be approved by a bankruptcy judge.